The brother of the man who police say killed at least 58 people and injured about 515 said his family is “dumbfounded” by details of the deadliest mass shooting in modern U.S. history. “We can’t understand what happened,” said Eric Paddock, brother of Stephen Paddock, identified by authorities in Las Vegas as the gunman who opened fire from a hotel room during a nearby outdoor concert. 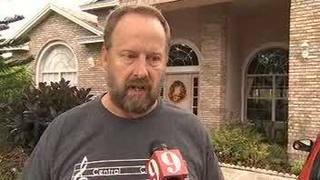 Paddock spoke outside his home near Orlando, reports the Orlando Sentinel. Eric Paddock said his brother was never an “avid gun guy” and didn’t have any background in the military. “He’s a guy who lived in a house in Mesquite (Nev.), and drove down and gambled in Las Vegas.” said Paddock, in a video clip of an interview posted by CBS News. “He did stuff, ate burritos. A motive for this shooting has not been determined at this point. The last time Eric Paddock spoke to his brother was after Hurricane Irma, when his brother texted to check on their mom. Eric believes their mother was the last one to speak with Stephen Paddock.